My teenaged daughter gave me the best holiday gift last year. 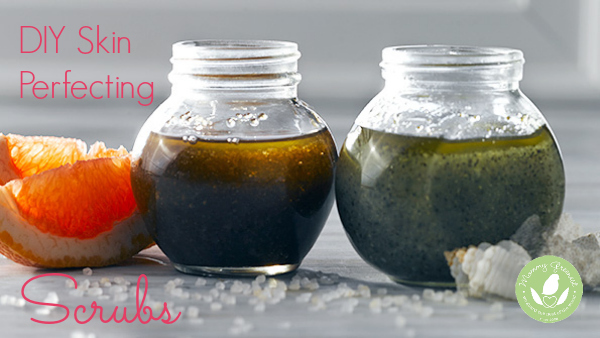 In a small recycled jar, she’d mixed together sea salt, grapeseed oil and mint essential oils into a natural skin scrub. This heavenly blend not only turned my shower into a spa, it transformed my skin: When I scrubbed it on and then let the oil soak in before toweling off, my cracked and chapped winter skin was suddenly soft, smooth and hydrated. With this miracle in mind, I discovered a natural skin scrub recipe that’s easy to make in minutes. A good natural skin scrub can transform your skin from cracked and chapped to soft, smooth and hydrated. This recipe is easy to make in minutes! When done properly, the process removes dead skin cells and supports healthy circulation. But the products you choose—and how often you use them—are key to ensure you’re making the most of your scrub. First, scrutinize those ingredients! “A lot of us were brought up using facial scrubs that slough off dead skin with crushed nut shells or synthetic beads, but it’s easy to go overboard with those physical scrubs,” Hart said. In addition to potentially irritating your skin, there’s an environmental reason to avoid microbeads: They can build up in lakes and rivers through wastewater. Many states have banned their use in personal care products and President Obama signed the Microbead Free Waters act into law last year. Luckily, you can love your skin and the environment by choosing a natural skin scrub that utilizes natural exfoliating ingredients like sugar, salt, oatmeal and coffee. Such ingredients not only remove dead skin, but also offer various other skin care benefits: Sea salt is rich in skin-supportive minerals, and coffee’s caffeine may help tackle cellulite. I always come back to a tried-and-true oatmeal natural skin scrub that transforms into a mask with the addition of egg whites. Love! Enzyme-rich exfoliants are another great option, especially for the face, which tends to be more sensitive than the body. “I vastly prefer using enzymatic exfoliants from natural ingredients like pineapple, papaya, pumpkin, or honey that gently loosen dead skin cells and result in incredibly smooth, even skin, with little to no irritation,” said Hart. For years, I’ve used a lemon-and-honey exfoliating process to lighten dark spots and reduce fine lines. It really works! The next question: How often should you exfoliate? Many women aren’t exfoliating enough, but you also don’t want to overdo it. How often you exfoliate depends on a range of factors, according to skin care experts: age, skin type, where you live, and if your skin gets easily clogged. To start, opt for twice weekly; then listen to your skin and adjust the frequency if you’re experiencing dryness or breakouts. This easy-to-make natural skin scrub is good to go from head to toe—you can even use it on the delicate skin of your face and décolletage, or amp up the exfoliating power by applying to dry skin first. The sugar gently softens, while grapefruit essential oil cleanses, smells amazing and acts as a natural preservative for your scrub! Put sugar in a container that comes with a sealed lid. Slowly add the almond oil, mixing as you pour. That’s it! What’s your favorite exfoliating secret? Please tell me about it, in comments below. Happy scrubbing, friends! This post was adapted from Delicious Living. This is a great recipe shared by you. I have cracked skin and the situation became worse in the winter. I avoid scrubbing this time. I use vegan face toner – ELUXE™ Moisturizing Toner in this winter season. This oil-free moisturizing toner have intense hydration, nourishment and protection power for any skin types. I will try the homemade scrub according to your description. I hope I will have a perfect scrubber for my skin now.